Corn, often referred to as maize, is grown worldwide and is a staple food product. It is used to make corn syrup, cornstarch and corn flour. A by-product made from the starch of corn kernels is ethanol, an alcohol-based product that has many industrial uses. 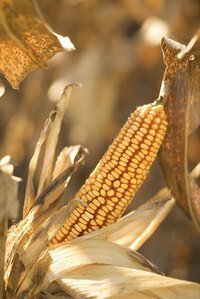 Corn used food production is generally wet or dry milled, depending on the type. Corn is usually associated with the sweet tasting vegetable, sweet corn. Several varieties of sweet corn are grown, including baby, white, purple and yellow; the latter is the most common variety. Hominy is made from field corn, which has a tough outer skin. The only way to eat this type of corn is to soak it for long periods, so the skin softens and can be removed. Hominy is only used for cooking while corn and corn byproducts have many industrial purposes. Hominy is used in soups and stews, or dried and then ground to make tortillas, bread and grits. Hominy is produced by removing the bran and germ from the corn kernels and it is boiled, soaked or ground. Soaking corn in lye makes lye hominy. Another method is to soak the hominy in a mixture of water or lime. Hominy can be purchased fresh or in cans. Corn is used to make corn-based products, many of which are used as an ingredient in many ready-made food products. The germ is removed from corn kernels to make corn oil, while the kernels are used to produce items such as flour, which requires a process known as dry milling. Making cornstarch and corn syrup involves a process known as wet milling. The corn is soaked in water and then separated into starch, germ, fiber and gluten. Industrial uses of corn include skin care products, crayons and soaps. Corn is used in many types of food. Hominy is just another method of using corn. Hominy is one method for using whole kernels, whereas corn was traditionally milled to make flour. Now, corn is processed to be used in many products.